What's a hot summer Friday night without fish and chips? When you've no mood to cook and, let's face it, the house is already too hot without turning on the stove and oven (there's nothing in the house that could be prepared via use of the microwave alone) the local fish and chippery is a happy haven. 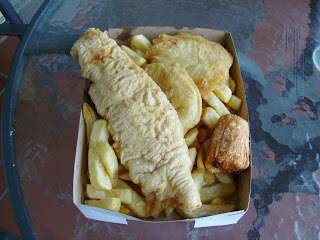 We're blessed to have some of the best value fried seafood and starch in Melbourne very close to hand. How much would you expect the serving shown below to set you back? To help you guess, included is a piece of fish too large to fit the box, two potato cakes, a dim sim, and more chips than we could ever eat and retain healthy heart function. $7.70*. That's right. And if that makes you shake your head in wonder let me add to your incredulity: this is what they call the Single Pack! (Oh yes, and it comes with a can of soft drink as well). The fish is plentiful. As you can see from the picture it comes in a pale batter and probably tastes best immediately out of the oil: it doesn't tend to be particularly crispy by the time you get it home. That's OK though because the ratio of fish to batter is very much in favour of the flesh. The potato cakes are hefty as well, with a wonderful crunch to the batter. And the chips are good enough that I always eat way more than I needed to, normally at the expense of the poor dim sim (excellent with soy sauce). Thanks for the suggestion, this place was hiding just 5 minutes from my place. Pretty good. Better than Queens' Parade fish and chips. The single pack has gone up to 9 bucks but still a good deal. There's a crazy papa's burger which has double meat, double cheese, bacon and a potato cake in it. That's next on my list to try. Glad to hear I could point you to some good F&C so close to home! This place does excellent take-away fish and chips, but the burgers and steak sandwiches are excellent1! The best in the northern suburbs in my opinion! I'm always up for finding a truly good burger, so I'll have to give Pappa's range a try. Always hard to get past that single pack fish and chips when it comes to ordering though! I tried one of the burgers on Friday night - not bad at all, and very well-priced. Cheers for the tip!